Whether you have a single vehicle or manage a fleet, you can create a bumper-to-bumper marketing machine with our fast and easy custom vehicle wraps solution. We can easily display your pertinent business contact information on the back and sides of your vehicle, including web address, contact name, phone numbers, address and email address. What Does Having Vehicle Advertising Wraps Installer Mean for You? You can be assured that your brand and vehicle are being handled by fleet wraps installers that are committed to doing the best job possible and is backed by credentials. It demonstrates our commitment to providing you the best van wraps installation possible, and give you the confidence that your job will be done right. Vehicle wraps graphics installers must prove that they are top in their field before they are awarded certification as a trusted Vehicle Advertising Wraps Company. Our van wraps design teams have a vast knowledge in this industry and are extremely talented to provide full-service vehicle wraps graphics design to solve your toughest creative challenges. Designers of Adpro Design Inc have had been working with a wide range of customers from some of the largest fleets and best-known brands, to small local and specialized brands in Peabody MA. They are experts in the world of large-scale custom vehicle wraps design and printing; with an emphasis on details that will help you best represent your brand. At Adpro Design Inc, we dedicate a designer to each client, ensuring your artwork is consistent and brand standards are met. Our creative vehicle advertising wraps design team will work with your internal team to provide design instructions and templates. Before going to print, our van wraps designers will review files for color, size and content requirements before sending a digital proof for review and approval. Creative custom vehicle wraps design services are available with us for clients who don’t have their own graphic designer or do not have print ready artwork. We’ll meet with you to discuss design options and artwork requirements, and then present you with three options to choose from. Once the creative design is finalized and approved we’ll go to print. 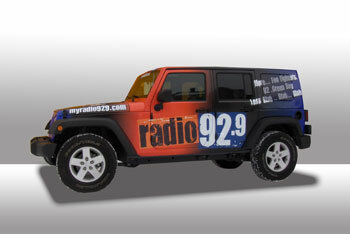 We have full access to thousands of vector elements that can be used in your vehicle wraps designs in Peabody MA. So, contact us today for a quote or visit us online to know about our affordable vehicle wraps prices in Peabody Massachusetts.